Finalises the complete output by this important New York stage performer up to 1930. Includes rare sides issued on Columbia’s export “X” series. Jazz collectors note – this is HOT black jazz! Adolphe Thenstead (pno), Walter Edwards (clt), Cyril Monrose? (sax), possibly Gerald Clark (bjo), probably Sam Manning (bottle and spoon – 1), probably Sam Manning-2 (claves). Unknown (pno), Cyril Monrose? (sax), Unknown (cuatro). vocals with Porter Grainger (pno). Jack Celestain (pno), Cyril Monrose? (sax), Gerald Clark (gtr), Unknown (cuatro). Jack Celestain (pno), Unknown (clt-1), Unknown (sax), Cyril Monrose (vln), Dr. Charlie Ford (cello bass), Gerald Clark (gtr), Unknown (cuatro-2). 2nd male voice-1, Jack Celestain? (pno), Cyril Monrose? (sax), Walter Edwards? (clt), Unknown (Sb), Gerald Clark (gitr or cuatro? 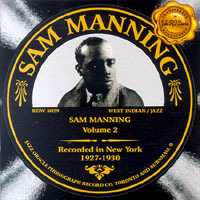 ), probably Sam Manning (maracas -2).